We are almost there, aren’t we ? Christmas Eve will be celebrated later tonight . Most cards have been sent, the Christmas tree is all lit up as I write and the menu for dinner is ready… in my head. Our village postman has been busy delivering mail and packages. Yesterday I was on his list, he brought me a large parcel sent from the United States. 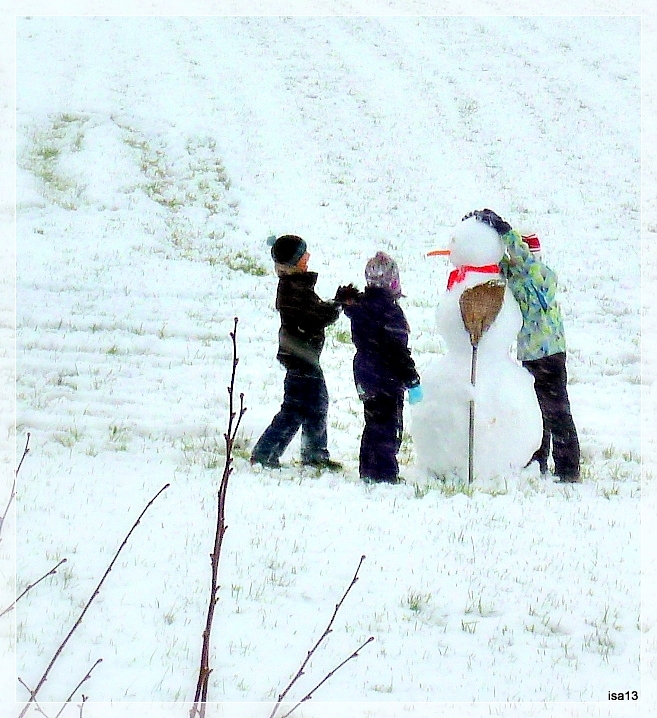 Snow had fallen a few days ago and children spent hours in the field near our house building a snowman. A joyful party that was still there at dusk, surrounded by parents and friends, screaming and jumping around their artwork. Today snow has melt, the only remaining sign of the snowman is his red scarf and a carrot that is looked at with greedy eyes by Nino the beagle. Most of these handmade cards are gone, sent to family and friends here and there. 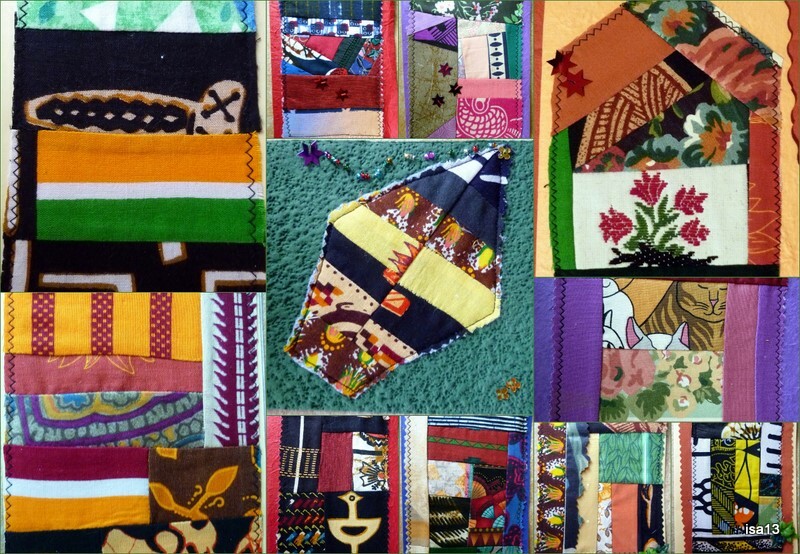 My box of African fabrics scraps is almost empty. It is a good feeling to imagine that maybe these cards will give as much pleasure as I felt sewing them. Bringing some thoughts, light and strong colours where and when they are needed. This mosaic is also meant to bring you, my Friends, my best wishes for A Merry Christmas. A celebration of peace and togetherness, sharing time and affection, joy around the Christmas Tree. Feliz Navidad, Joyeux Noel, Merry Christmas, Glaedelig Jul, Hyvaa Joulua, Sretan Bosic and more good wishes wherever you are. Joyeux Noel, Isa! Have a wonderful holiday. Did you receive my email about the pochette? I was so happy when it arrived, and the pieces of fabric that came with it were delightful. Merci, once again. Thank you so much Isa! Merry Christmas to you. I love the tree ornament that your friend Fina sent to you. What a beautiful Christmas post, Isa! All the best to you for the holiday season!!! What a fine and colorful decoration. The handmade fabric cards are pretty. So is the lovely ornament gift you have received. Christmas has come and gone but still shared through your wonderful photos and words. Hope yours was as warm as the feeling I get when I visit your blog, Isa. Happy New Year! Glædelig Jul Isa. Maybe I’m a little early this time. There is almost a years waiting ahead before the day comes. I hope you got your Christmas dinner finishad for the table too. We had duck and pork for our dinner. The pork roasted until the skin gets chrunchy. Merry Christmas to you too, Isa. And what a great way to send your Christmas greetings by these WONDERFUL fabric cards!! Christmas has gone. I wish to You a very Happy New Year. What a delight it is to see a bit of my part of the world hanging on your tree! My best wishes to you for the New Year – may it be filled with as much beauty and creativity as you offer to us! Isa, I read this earlier, but apparently never paused to leave a Merry Christmas greeting! 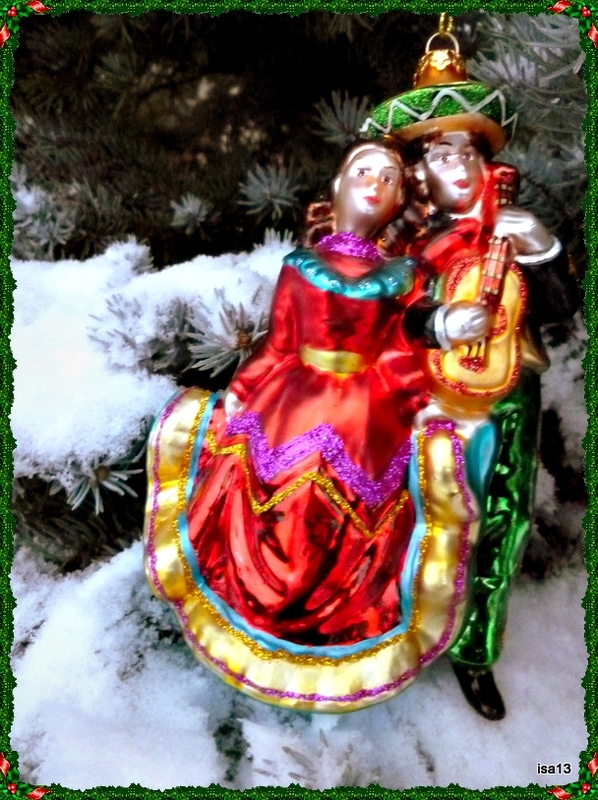 What a cool ornament…I’m betting the couple enjoyed a Mexican salsa on your pine tree branches. Hello, I nominated you for the Versatile Blogger Award. Congratulations! Check my page for nomination. What a wonderful surprise coming back home and finding all your warm comments on this post. I had so much pleasure reading each of them and hope you all had a beautiful Christmas. Karen, Tammy, montucky, serena, YesBut and Mrs. YB, sonali, Andrew, Birgitte, Cin, iniyaal, Scott, Carsten, truels, Matti, Linda, Kathy and Minna… I thank you from the bottom of my heart. Karen, I am really happy you enjoyed the pochette and pieces of fabrics. Carsten, yes fortunately I had the Christmas Eve meal ready in time. We had a Cretan first course (figs, goat cheese, salads, olives, rye bread), then a risotto with Saint-Jacques’ scallops, a choice of cheese and as dessert a gingerbread cream. All disappeared quickly. Matti, thank you so much for your Award ! Christmas has been and gone by the time I am reading this, Isa. But I hope you had a good one. I love your cards and your snowy scene. The Mexican decoration is beautiful. I collect (and make!) handmade decorations from all over the world and have several large boxes of them waiting to go back under the stairs, which I will do later this morning. Yesterday I was visited by a Mexican friend who had been home for Christmas. She had photos of how Christmas is celebrated in Mexico – with the central importance of the Nativity (la Natación), piñatas which are not as beautiful as they were when she was a child (they used to fill them with small fruits rather than sweets) and the Mexican cactus known as the ‘nopal’, So lovely to see how the same festival is celebrated in other parts of the world. Hello again, Janice. What a great idea to collect Christmas handmade decorations from all over the world. I remember seeing one of your posts with pictures of German decorations, right? How nice to have had the visit of your Mexican friend. The “nopales”, upper, fresh and soft parts of a particular kind of cactus, is used in various meals. Fina, who lives in the South West of Texas, made a soup and a salad of nopales when I visited her there. Different and good. Mexican food is one of my favourites. Again books… have you read “Like Water for Chocolate” by Laura Esquivel ? A magnificent novel whose story often happens in the kitchen. Have a pleasant Sunday, Janice and thanks for your warm words. I do have some German decorations (bought at a Weihnachtsmarkt in Lübeck) but I don’t remember doing a post about them. Keep meaning to do that but am always rushing to get things prepared for Christmas Day by the time the decorations are up! Yes, Carmen told me they eat the nopal too – I’d love to try it. I have Like Water for Chocolate in English and Spanish and also have the film! Hello Janice, sorry, I must have seen German Christmas decorations on another blog. I never saw the movie “Like Water for Chocolate”, see if I can find it. What a beautiful story and fascinating characters ! I love Mexican and South American litterature. Have a pleasant week, mine will be snowy and Siberian.